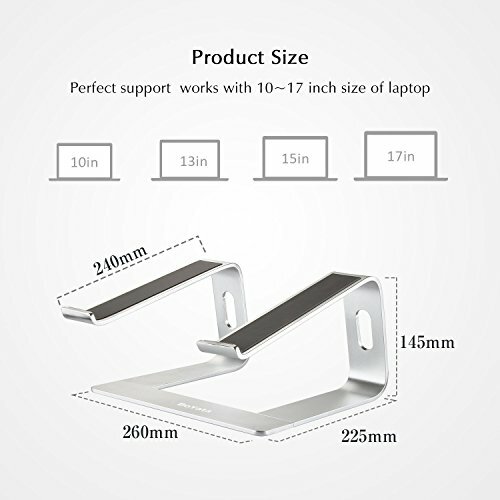 【Space Savings】The MacBook laptop stand can literally return lost space back to your desk. The two cable outlets on the stand keep your desk organized and tidy. 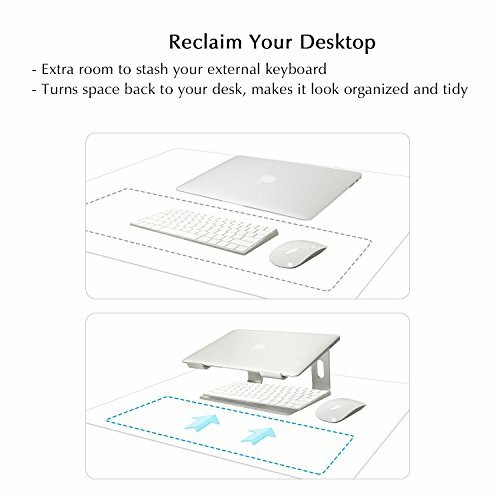 Also, there is extra room for you to stock your external keyboard. This stand comes with three dismountable metal arms for convenient operation and maximized portability. 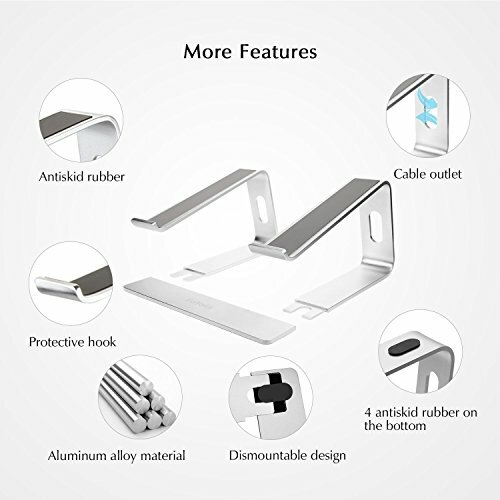 【Quality and Durability You Can Count On】With three aluminum support brackets, this notebook stand is built with quality in mind to provide solid stability. The stand is fully padded with thick rubber on its top as well as four rubber on the bottom - all for anti-sliding. No part of your notebook actually touches the aluminum surface! This stand also has a protective hook on each arm to prevent your laptop sliding towards you when in use. 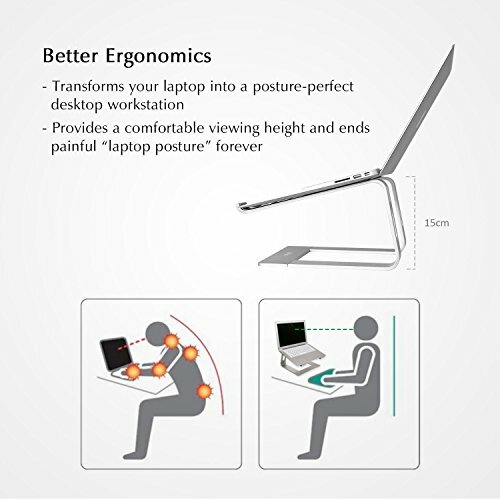 【Ergonomically Styled With You in Mind】The mac stand not just created for a laptop, but also designed to be effective in improving sitting posture to help minimize muscle pain associated with long term sitting. 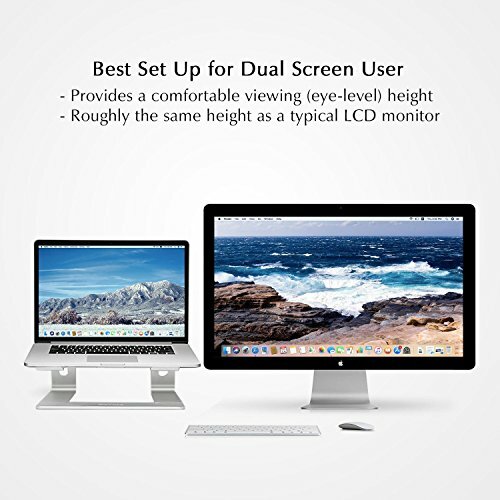 This stand provides a comfortable viewing height (eye-level) which is roughly the same height as a typical LCD monitor. All around the design of this unit is geared toward improving user productively and comfort. 【Make your Workstation a Stylish One】Apart from the stand's advantageous technical features, Boyata offers a contemporary design that will add a modern touch to any office or room, while at the same time keep your laptop cool with 360 degrees of ventilation. 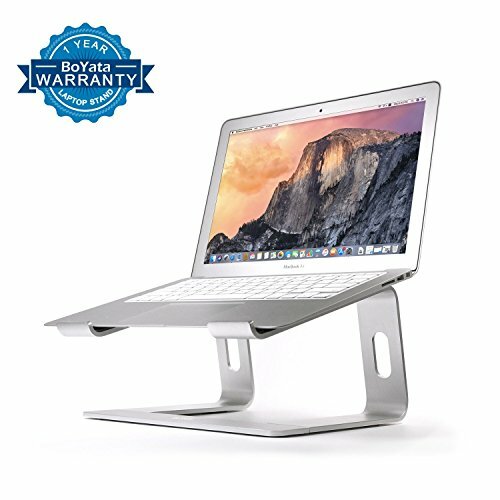 The apple computer stand is designed with the same premium-feel and color(s) as a MacBook, and also fits all MacBooks as well as most 10-17 inch notebooks. 【A Warranty You Can Count On】Boyata is covered by 24/7 online support and is backed up by a RISK FREE 100% money-back guarantee. RISK FREE 100% money-back guarantee, We provide 1 Year Warranty, kindly contact with us if there is any quality issue.